That's the very desk I am sitting at. Just look at the stacks and stacks of cards not where they belong. How about we go through a little walking tour of the two pics, cuz basically, I want to drag out this post a bit. In the first, you see my daughter's room in the background. I ate all the Tootsies from the bank; sorry. There are packs of '11 A&G (from the local Meijer's) along with '12 Topps series 2 and a bunch of other packs from some repack box I bought. Gotta organize those. Center bottom are Sox cards from Jeff Laws at My Sports Obsession. Just to the right of those are more cards from a repack box that also need organizing. At least the wrappers are gone. Right again and we have cards from JABO via Jeff Laws. Doubles Jeff didn't need, so I will take them gladly. Behind those we have more '12 Topps series 2 that need to go in their box, along with some '12 Bowman and yes - more from a repack box. 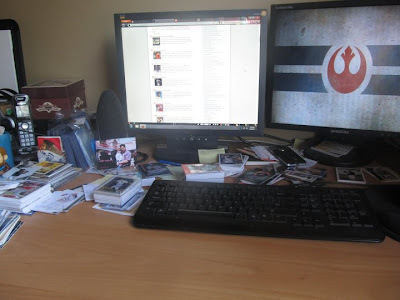 Other highlights in the picture are my scanner, all the yellow envelopes from trades and eBay, Obi Wan and 3PO hiding among the cards, and a 08-09 Hawks pocket schedule. Picture two starts with a photo my daughter put in my father's day card, which she handed to me while working on the floor. Crying while using power tools is not recommended. She's maybe 2 in the picture. She's 16 now. Ok, the clear 50 card case came from Matt at Once A Cub from a break. He threw in a bunch of great extras. Just in front of the pic of my daughter in a Duncan Keith auto I scored for $2. Then we have some Panini Elite hockey, that crappy stack of Debut no one seems to want, a Bernie Nicholls auto I pulled from UD Parkhurst (love those cards), and then far right are cards I put aside for certain bloggers, just cuz. BTW - the wallpaper should explain why Obi Wan and 3PO are hiding on my desk. Wanna have some quick fun? Take a guess at what set is in the small white card box in picture #1. Get it right and I'll send you anything you want from my trade bait. One hint - that is a complete set in that small box. So there you have it - my life totally jumbled together. 08 Masterpieces. 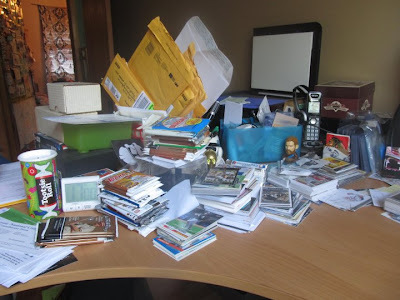 I love a little card chaos!